Fantastic!!! Thank you very very much for your work. There is finally a place where one can easily get a transparent idea about making Soft Iron Calibration. Site found, steps followed, Hard and Soft Iron Calibration done. that is really interesting, I have tried to do but not successful because I am beginner. I am working with sensor HMC5883L but the "processing software" can not read any data from this sensor this is Arduino code I got from Arduno example. can you please help me to send data to processing software. Those buf are configured just like you said. Can you helo me, thanks a lot. Hello, you could use the python script (using the - g option), or the processing script to collect points. Using the python script you should see how many point are been collected. If you are skilled with Java, try debug it with the processing script. Try to understand what does is sent by the micro. By any chance do you have the Ellipsoid code in python too? About the python Ellipsoid version, not in the next future. I'm sorry. Latitude - 51° 53' 53"
Longitude - 8° 29' 28"
Is (1) in the python equivalent to (5) from Matlab above ? (2),(3),(4) equivalent then to (10),(11),(12) ? I have some sample data that I can share to do a quick sanity .. if it is okay to send you an email then I could explain better there? Your offset values (ellpisoid center) seems too small to me, especially if compared to your ellipsoid shape. Yes, send me that email, but i tell you beforehand that I do not have time to do this type of sanity check in this period. The bias of both look similar(?) but the matrices look quite different. I notice that the Matlab does not factor in 'Hm' (the Earths Magnetic Field)? Magneto uses a slightly different math for the Ellipsoid calculation. But the values should be similar. Try with another magnetometer, the one that's looks odds to me are the ellipsoid center (offset) values. Hello thank you for your good projects .I download this project and when I run python script I get this massage: "ImportError: No module named serial"
Hello, You have to install pyserial on python. No problem. "No module named" means that you have to install that module, So you have to install the mpl_toolkits module. More generally, you can find usefull information on Traceback googling aroud for the error. You should encounter a few if you have no module installed. Now what I should do to plot? It's the python script help. As example run "magn_docalibration.py -g" to collect data. Then you could use the matlab script provided to compute calibration values. excuse me I'm a little confused.I connect hmc5883l(gy_271) to AVR board and then to serial com1 on my computer and load hex file to AVR Atmega16l then run magn_docalibration.py in python shell and now what I have to do to plot like you do in youtube video? I can see hmc5883l send data to hyper terminal . You have to collect data points. You can do this by the processing sketck, or using the magn_docalibration.py script. This script is writte on Python 2.7, that may be the problem. No problem at all. It should have somthing to do with your version of python, here I've no problem. you could try python -V to check your python version. Also try the processing.org script to collect the data point. That could be easyer. where I should write python -V?in python shell or cmd? hello i can't run python script .I want to collect 100 point in then run ellipsoid fitting to these points .all in atmega16 without any PC. can you give me an algorithm to how can I do it? Hello, you can collect 100 point to an array, then use this array of points as you need. hello .i can't run python script .i want to run the ellipsoid fitting in atmega16 .collecting 100 point and then run fitting part. can you give me an algorithm how to do it? If you can not run the python script, you can run the processing.org script provided in the download link of this page in order to collect the points. i can't find processing.org script ? where is it? calibration points to be setup with other script "
I suppose there's something wrong in your python library, you should get points collected to a magnpoints.txt file. You have to debug the python script, check the collectpoints method. is there any manipulation of code to do it right? which code have to be programmed to avr? The avr firmware sample can be found in the readme file, the "avr-gcc snippet" part, if you are using avrgcc as compiler. For debugging the python code, the most simple way is to use the print function, or you should use the python debugger. excuse me can you record a short video of python code running? Hello. I'm sorry but i can not do this. I'm actually envolved full time in other project, the point collection running in python is something like the one you see in the video of this post, which is running on processing.org. If you can not run the python script, my suggestion is to run the processing script. Or find another script online to collect your points from the magnetometer. It means, wait until a 0x22 it is read by the uart library of your micro. calibration points to be setup with other script""
and I totaly confused what should I do"" PLEASE HELP ME ""
"Display -1 does not exist, using the default display instead. Hello, this is a processing.org error on the RXTX port, you can find usefull information to recover this error on the processing.org forum. You can start checking if your Java Runtime edition fits the processing.org version. Also try to start some processing.org sample, to see if event the samples sketch does not works. 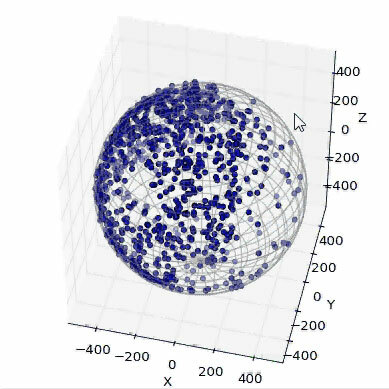 I would like to use the matlab function to calibrate my magnetometer. I run it and it works perfectly. However, I need to calculate the calibrated data right ? You said that we have to use the scale factor and offset value to get the new data but I don't see those variables in the matlab function. Hello, and thank you for your feedback. Look at minute 2:18 of my youtube video, the matlab output you have to use is the one i'm selecting. e_center are the x,y,z offset and comp (line 1) = scalefactor_x and comp (line2) and comp(line3) are y and z respectively ? Actually I calculate that and I don't get a perfect circle for the calibrated data, I think I should, should I ? Moreover, if I calculate the module of the x,y and z (u = sqrt(x.^2 + y.^2 + z.^2) I should find the same one, right ? I also don't use Ellipsoid radii and Ellipsoid evecs, is it normal ? Hello, take a look at the "MorganMay 15, 2015 at 1:28 PM" comment and reply. Actually I read his comments and replies but it does not seem to work correctly. So I probably make a mistake somewhere. Fisrt when I run the matlab code I get a ellipse at the end.. I should get a circle right ? A good calibration leads to a circle, isn't it ? Second I used Magneto 1.2, and I don't succeed by this way also. To be sure in Norm of Magnetic I put the one I would like to reach or I put the one I calculate from the raw data (if it's points 2, the norm is different at every point since it's not calibrated yet). The green image should be a the fitted ellipsoid. Should be something next to a circle. At first, what calibration does not works for you? soft, or hard iron distortion calibration? Hello Davide! Sorry I have not seen you reply. Thank you. After the calibration, I plot the 3 angles (using atan2 on matlab). And when I move the device only around one axis, I should find a angle of zero (around zero) for one of the three angles, and I don't. So I suppose that the calibration process is wrong. I don't know if you see what I mean. What angles are you talking about? So I did not solve both distorsion. I have an offset (this is pretty easy to correct I think) and I also get a kind of an ellispe, so this is soft_iron distorsion. I would like to get the angle of my device related to the north. So forward/backwar axis is x, medio-lateral is y and vertical is z. So I need the angle between z and y.
I'm sorry but I don't get it. Usually, if your z-axis is parallel to ground, you get y and x axis value, then you measure the heading of your device by arctan2 those values. Then you transform this value to degree, and you add the magnetic declination for your location. Ok thank you for your help. I will keep going to find my needs. hello processing running without any error and avr(main.c programmed to avr) send code to com1 but no point shown in processing 3d plot. is there any code manipulation needed? or i'm programmed wrong code on avr? What do you get in processing reading routine? Debug there. hyperterminal show x,y,z. I want to use your processing sketch. what changes in my code is needed? Hello. You have to use the commented part of "//Serial.write". Please do not flood with data comments. processing is running but no point shown 0/1000. it's like processing sketch don't get the serial numbers .but when I use HyperTerminal instead of processing , I can see Numbers changes in HyperTerminal of windows7. So, it seems something related to you processing engine. You have to debug the serialEvent. At first, write a new sketch and a new simple rom for your micro, and test if it works. It should be simpler this way. hello I found the processing code problem by do //port.write(0x22); the processing plot points. i think there is problem with port.write command. thank you so much your work is so great. hello thank you Davide thank you ariyan.I comment //while(cgetc() != 0x22); in magn_docalibration.h and also commend //port.write(0x22); in processing . and everything work good thank you so much. Hello David i think that this is not a reel time calibration am i right ? Hello, not this one. But you can implement it insiede the microcontroller logic.